It’s been about a year and a half since Johnny and I moved to our small farm outside of Tulsa. The experience of living on a few acres and being wholly responsible for the horses’ care has been generally positive; of course, it helps to have a friend running a boarding and training facility right next door! I’ve started to think seriously about what improvements I want to make to the farm. There are several things I’d like to do that will make things easier, safer, and more attractive. Improve footing in stalls. Right now, my stall floors are dirt. My horses don’t spend tons of time in their stalls; the barn is adjacent to a small paddock where the horses stay at night. I keep the stall doors open so the horses can go in and out as they please. When it’s especially windy or rainy, they’ll hang out inside. As a result, the floors are in pretty good shape. I’d like to put a layer of screenings in the stalls to level them out and provide a compacted surface. I want to add interlocking rubber stall mats on top of the screenings; I know that will make the stalls easier to clean to reduce the amount of bedding needed. Remove stocks and add mats to make a grooming/wash stall. There’s a wash bay next to my tack room that I never use because it’s got a set of stocks in it that none of the horses will go in. The stocks are pretty handy for hanging sweaty saddle pads on, but I really need to remove them, add mats to the area, put a set of crossties in, and use that area as a grooming and wash stall. Add mud management panels to the area behind the barn. The area behind my barn where the stalls open to the outside is heavily trafficked and gets muddy when it rains. I’d like to add some mud management panels to it. Replace and expand fencing. The fences on my property aren’t in awful shape (well, a small section behind the barn kind of is), but they’re definitely sagging in a few spots. I’d like to replace all of the square wire fencing with something else; I’m intrigued by the Ramm Per4mance Flex Fence. I’d like to expand the pastures by a little bit, too. The front pasture can come toward the house another ~15 feet, which means I’ll have less to mow (and the horses will have a little more to eat). The paddock behind my barn can be expanded, too. I’d also like to add a fence along the property line I share with my friend. Right now, if a horse gets loose, I can shut a gate across my driveway, but horses can still run to my neighbor’s facility and possibly down her driveway and into the street. I’m looking forward to making these improvements! Saving up for some of the major ones (like fencing) will definitely be a long-term process, but it’ll be nice to have my farm exactly how I want it some day! That’s a great list of improvements! I have the Ramm puzzle piece stall mats. It was definitely not a good time putting them in, lol. I’m kind of meh on them, once it got cold I started noticing that I would catch my fork on the seams. Maybe I didn’t leave enough room on the outside though for expansion. Interested to see what I have when the weather warms up. I have Ramm’s 425 Flex fence as my top rail in all the new sections we did (ie most of the fencing). Husband and I were able to install it ourselves without too much difficulty. They provided nails to put up the brackets which is the dumbest thing ever so we did have to go buy screws. Also had some issues where I had to get special brackets instead of the regular ones just based on my layout. Thankfully I live near Ramm so I could go pick things up. Mud management is number 1 on my list for improvements this year – I was very disappointed because I was around my property as a kid and never really saw mud around the barn but I guess they maybe didn’t turn out as much. I like the idea of the lighthoof that you tagged but afraid it would be insufficient and wonder how you put gravel on it without it falling in? I’ve looked at things like hoofgrid as well but omg the $$$. Still trying to decide if maybe just removing the mud and adding some gravel at the right grade would be sufficient. Is there a way to find that out without trial and error? Lol. That’s good to hear about the 425 Flex Fence! I’ve been looking at their interlocking stall mats, too, so it’s nice to hear your feedback on them! I’m really intrigued by the Lighthoof panels! Many years ago at my dad’s farm, we tried removing mud and adding gravel. It worked okay, but it seemed like the gravel would eventually wash out or sink down and the mud would re-emerge. I was about 12 when we did this, so I can’t say how much thought my dad put into that project (e.g. grading, gravel size, etc.). When our mud first started appearing due to the insane number of times we’ve done freeze and thaw this year I bought $100 worth of bagged gravel and spread it just to see. It did help substantially even just adding it to the mud but I do question the long term benefits vs cost. I’ve given up now, we are on freeze and thaw number 8 at this point and there is just nothing I can do at this point even though I hate muddy horses all the time and worry about Stampede getting cellulitis again. Someday spring will come and the pasture will dry up right? I mean it’s just supposed to rain the next three days…after snowing Saturday night. Ugh. The lighthoof is super interesting I agree. If you do it I’d love to hear about it! I did see some similar non-equine marketed versions of it out there as well. I found some other versions of hoofgrid for use on driveways, etc too but price didn’t seem much better. I will definitely keep you posted if I end up buying the Lighthoof. We’ve been in a drought in Oklahoma for a few years, so I don’t have to deal with TOO much mud. We’ll usually have one or two rainy days every month or so, followed by two or three muddy days, and then everything is dry until it rains again. The muddy area by my barn isn’t huge (maybe 25′ x 20′), so I don’t think it would cost a fortune to install the Lighthoof. It looks like it would be trickier to install than HoofGrid, though! I just gave up and embraced the mud. I have too many horses and muddy areas to be able to afford the lighthoof, and honestly, I can think of less experimental bang for my buck elsewhere. 😉 I have a lot of barn projects coming up this year too, so I feel your pain! sounds like lots of projects that might make a huge difference for you! my current barn is a big fan of using gravel and stone dust for mud management but yea…. it’s something that has to be regularly replenished rather than just doing it once and being done with it. the light hoof stuff looks really clever tho. i was kinda super annoyed at the company for writing an article hocking their product by expounding on the dangers of “frozen muddy peaks” to horses hooves….. like. c’mon guys, really? are you seriously gonna tell people that their horses could be injured by the ground in order to sell product???? the product itself does seem pretty cool tho haha. Cool ideas for sure. Looking forward to your results. The truth is that the list never ends! I dug up outside the stalls and put in drainage tile. That helps a ton to keep the mud to minimum but the rest of the small area is a terrible. I have been unsure about spending the money for those drainage tiles but some days…. I would also love a fence down one side and the front of my property. I’m settling on planting evergreens to make a natural barrier. I love my horseguard fencing- it works really well. I wonder if the flex fence will stretch over time. Our stalls are gravel base, the a few inches of crusher dust and then rubber matts on top. There is some unevenness now (6 years later) so this summer we will probably take out the mats and level/repack it. Since I have been going out to see my horse 2 – 3 times a day, I am getting to realize how much BETTER I know her just from being around her that much. (Although, she doesn’t appreciate me “poking” her in the eye every time I come.) I am super jealous that you get to see your horses all the time. 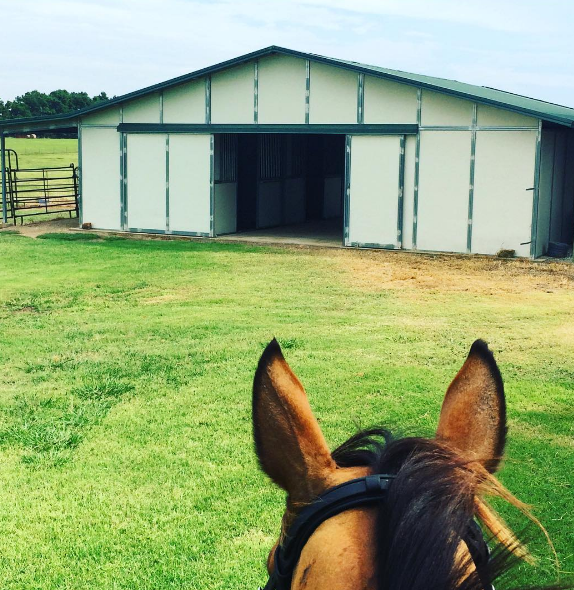 Would love for you to do a write up about the little improvements you have made (or decisions you made while building the barn) that have really made a difference. I’m with Teresa, the list NEVER ends! I got several things crossed off my list this past year, but the mud situation is still a problem. I did move one gutter, and even that helped a little though! And what if you have a welder just remove the sides of your stocks? Then you could have a tie rail?